Recently a forming cohousing group contacted me for training. Unfortunately they were too far away for me to make the journey, but i* wanted to at least send them some initial advice. Here’s what i wrote as recommendations for new cohousing groups. 1. Before the group is 12 people, make an agreement that *everyone* will assist regularly with common meals (either cooking or cleanup). By the time you are bigger than a dozen people it may become prohibitively difficult to pass that policy, and passing it leads to more common meals which makes for a more cohesive and vibrant community. Eating together regularly preemptively solves many other potential issues. 2. Make sure anyone considering joining agrees (preferably in writing) to follow all preexisting agreements. Index agreements by subject, not just date, to make it easier for both new and old members to find items by topic. 3. Take steps early on to establish whatever culture you want to foster regarding giving each other feedback. Conflict avoidance causes problems to snowball, later becoming giant and expensive and awful (angry departures, lawsuits, and so on). You need a way for people to talk when they are feeling unhappy or critical toward each other. It’s OK if someone needs to take a breather, cool down for a few days before engaging. But long-term unresolved conflict corrodes the community. Don’t discuss anything emotionally charged via email. Meet in person (or by phone if necessary during development before everyone is on site) and help each other to listen well. 5. Give everyone basic facilitation training. Even if they never volunteer to facilitate full-group meetings, it will make them better participants. Establish a strong and supportive culture around facilitation and your facilitators will stay involved and happily contribute to everything else flowing well. A strong and supportive culture means facilitators doing more than just calling on whoever has their hand up to speak next; it’s a more active model. At every full-group meeting, ask for specific feedback at the end: what worked well and what could have been better. That models graceful reception of feedback, and leads to a spiral of improvement over time. 6. Have fun together. “There’s no time for that!” you will protest. “There are a zillion committee meetings and everything else to get this place built.” Yes. Have fun together anyway. It’s the positive social rapport, the relationships nurtured, that will carry you through the work and make all that work worth it. Organize potlucks, reading groups, movie showings. Take things people would be doing individually anyway and invite them to do it together in pairs or groups, long before you are actually living together. At least once a year, have a big recreational outing together, a full weekend with no business meetings, just for enjoyment. Join the Cohousing-L email list. There is a wealth of accumulated wisdom, it’s an amazing resource. In addition to current conversations, there are extensive useful archives. Go visit other cohousing communities. See what you like, and ask them what they wish they’d done differently when they started. Learn from them. When you start writing policies, make use of the policy library, and contribute back to it. 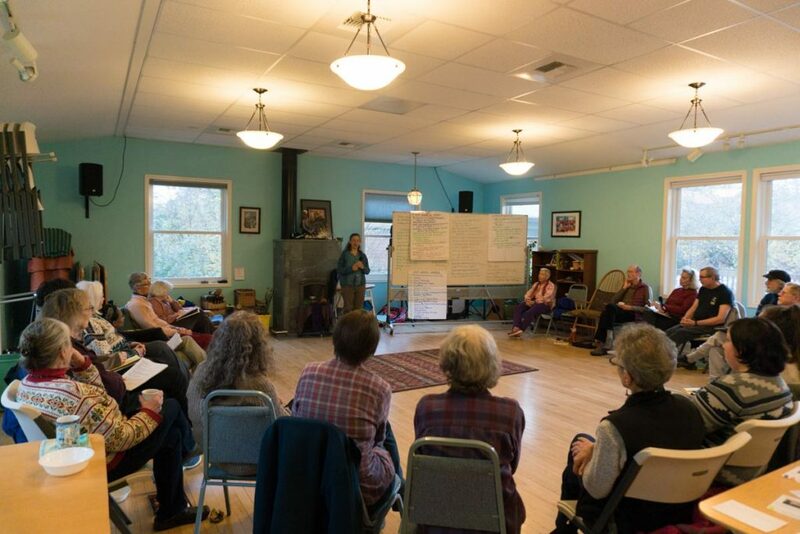 Encourage group members to attend as many conferences and cohousing-related events as they can. Join the cohousing association in Canada or the US and give back what you can. 8. Build the common house first. Aside from this list, i encourage you to get ahold of a few copies of the Group Works card deck, and integrate them into your group’s culture. A team working for the City of Calgary did that and it made a huge difference to their project of improving municipal government. What’s missing from this list? Comments welcome below. Laird Schaub has posted a response to this list at http://communityandconsensus.blogspot.com/2017/12/advice-for-new-intentional-communities.html.